The Theophany of Our Lord and Saviour Jesus Christ. Matins, Divine Liturgy and the Great Blessing of the water. After Pascha and Pentecost, the Feast of the Theophany (or Epiphany) of Our Lord Jesus Christ is the greatest feast of the Orthodox Church. Here Our Lord Jesus Christ is baptized by John in the waters of the Jordan, this being the first public display of God the Word Incarnate to the world. About the beginning of our Lord’s Jesus Christ’s 30th year, John the Forerunner, who was six months older than our Saviour according to the flesh, and had lived in the wilderness since his childhood, received a command from God and came into the parts of the river Jordan, preaching the baptism of repentance unto the remission of sins, saying, “Repent, for the kingdom of heaven is at hand!”. The Holy Scriptures continue, “For this is he who was spoken of by the prophet Isaiah, saying: “The voice of one crying in the wilderness: ‘Prepare the way of the Lord; make His paths straight. '” Now John himself was clothed in camel’s hair, with a leather belt around the waist; and his food was locusts and wild honey. Then Jerusalem, all Judea, and the entire region around the Jordan went out to him and were baptized by him in the Jordan, confessing their sins” (Matt 3:1-6). Further on, John said, “I indeed baptize you with water unto repentance, but He who is coming after me is mightier than I, whose sandals I am not worthy to carry; He will baptize you with the Holy Spirit and fire” (Matt 3:11). Then on the next day our Saviour also came from Galilee to the Jordan, and sought and received baptism, though He was the Master and John was but a servant. Seeing Him, John said, “Behold! The Lamb of God who takes away the sin of the world! This is He of whom I said, ‘After me comes a Man who is preferred before me, for He was before me” (John, 1:29-30). John tried to prevent Him, saying, “I need to be baptized by you, and are you coming to me? But Jesus answered and said to him, “Permit it to be so now, for thus it is fitting for us to fulfill all righteousness” (Matt 3:14-16). “When He had been baptized, Jesus came up immediately from the water; and behold, the Heavens were opened to Him, and He saw the Spirit of God descending like a dove and alighting upon Him. And suddenly a voice came from heaven, saying, “This is My beloved Son, in whom I am well pleased” (Matt 3:17). On this venerable day the sacred mystery of Christian baptism was inaugurated. From these events the Divinity of the Lord Jesus Christ and the great mystery of the Trinity were demonstrated. It is also from this that the feast is called “Theophany”, that is, the divine manifestation, God’s appearance among men. The Father revealed Himself to the sense of hearing, the Spirit to the sense of sight and the Son, further beyond these, to the sense of touch. The Father gave His testimony of the Son, the Son was baptized in the waters and the Holy Spirit, in the form of a dove, hovered over the waters. And when John the Baptist bore witness of Christ and said, “Behold the Lamb of God, which takes away the sin of the world” (John 1:29), and when he immersed the Lord in the Jordan and baptized Him, there were thus revealed both the mission of Christ in the world and the path of our salvation. About this St Cyril of Jerusalem said, ‘The beginning of the world – water; the beginning of the Gospel – the Jordan”. The Feast of the Epiphany reminds us of our own Baptism in the hymn sung just before the reading of the Epistle at the Divine Liturgy, “As many as have been baptized into Christ have put on Christ. Alleluia!” For in the waters of Baptism, we put off the Old Man and put on the New, that is Jesus Christ, and strive to acquire the humility shown by the Lord Himself when He, the Creator, bowed His head under the hand of John, the creature, in the waters of the Jordan River. That is, Christ takes upon Himself the sin of the whole human race. He dies under it (the immersion) and rises again (the coming up out of the water), and we must die to the old, sinful man and rise again, cleansed, renewed and re-born. 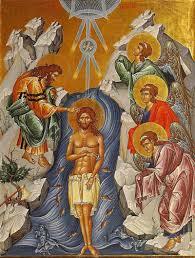 The Feast of the Theophany is also called the ‘Illuminating’, for in the Jordan there is given to us an illumining, revealing God to us as Trinity, consubstantial and undivided. That is one thing. And the other is that each of us baptized in the water is illumined by the Father of lights, through the merits of the Son and in the power of the Holy Spirit. When You, O Lord, was baptized in the Jordan, the worship of the Trinity was made manifest! For the voice of the Father bares witness to you, and called you His beloved Son. And the Spirit, in the form of a dove, confirmed the truthfulness of His word. O Christ our God, Who has revealed yourself and have enlightened the world, glory to you. Synaxis of John the Forerunner Afterfeast of the Theophany. Matins and Divine Liturgy.